The Dogo Argentino is also called the Argentinian Mastiff or Argentine Dogo. It is a muscular, yet graceful dog of mastiff stock with very strong jaws, and a short, sleek, glossy, thick, white coat. 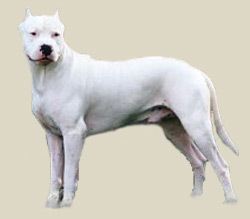 While not accepted in all clubs, sometimes the Dogo Argentino can have a black spot in the head known as "pirata". This trait in the Dogo/s coat is accepted by Federacion Cinologica Argentina. The head is convex in the front, with a moderate stop. The skull is massive and the jaws are strong and tenacious. The muzzle should be about the same length as the skull. The teeth should meet in a scissors bite. The ears are customarily docked and the eyes should either be dark brown or dark hazel with an alert, intelligent and intense expression. The nose should be black. The chest is wide and deep giving an impression of strength. The skin on the neck is loose to protect the dog during the hunt. The long tail reaches to the hock. It is never carried over the back, though the dog may swing it and carry it high when it is excited. The short white coat has no undercoat. The Argentine Dogo is an excellent guardian of the home. Loyal to the family, playful and intelligent. It is good with children and loves to kiss and cuddle with those the family accepts. Dogos are easy to train. This is a highly intelligent, powerful dog who needs a firm and consistent, but loving hand. The Argentine Dogo is not a breed for everyone. All dogs are individuals and some are more dominant or possess a stronger prey drive than others. With the right owners even the more dominant dogs can be submissive towards all humans and other animals. This breed needs someone who understands how to display leadership. Humans who are firm, confident, and consistent, this breed needs rules he must follow and limits to what he is and is not allowed to do. The objective in training this dog is to achieve a pack leader status. It is a natural instinct for a dog to have an order in their pack. When we humans live with dogs, we become their pack. The entire pack cooperates under a single leader. Lines are clearly defined. You and all other humans MUST be higher up in the order than the dog. That is the only way your relationship can be a success. When you put this breed with a meek or passive owner, problems may arise as the dog will feel he needs to, "save his pack" and run the show. Adult Dogos can be aggressive with other dogs however, the Dogo does not usually provoke the confrontation but may if he senses another dog who is unstable. The breed needs an owner who can tell the Dogo it is not his job to put another dog in his place. Breeders should work with prospective owners to match the dog with the right type of person. They are good with other pets if they are raised with them from puppyhood. This white mastiff needs early socialization with other animals. It also requires early obedience training. Dogos are natural heelers and respond wonderfully to positive reinforcement and motivation training. They enjoy working and pleasing their owners. On the other hand, they don"t do well with force training and may be stubborn to a forceful attitude. They can be trained for tracking, drug detection, support dogs, police dogs, therapy dogs, search & rescue, bomb detection etc. Training should begin at puppyhood. The single white coat is very easy to care for and has no doggy odor. Pay special attention to the nails, as they tend to grow very fast and therefore need frequent clippings. This breed is an average shedder.